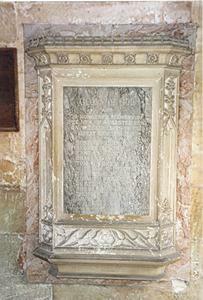 Marble tablet, on the East wall of the church porch, set into an ornate stone frame. Foliate design on the sides of the frame. The Memorial table is made of Caen Stone, with pink and black marble inlet and gilt lettering. Stone plaque, bow shaped. Base of plaque limestone, inscribed portion marble. Memorial is top turreted, and decorated with roses and leaves. There are two side panels, carved in the perpendicular style. The base is decorated with roses. A manual organ, on the northern side of the nave, was part the memorial. The Memorial was proposed to provide a place in the parish church in memory of the parishioners who lost their lives in the Great War. Order of information: forename, surname. Comments: The Memorial Organ was built by W E Richardson and Son of Manchester at the cost of £ 450.